As temperatures dip, it’s important to prepare your car for harsh winter weather. Not only can the elements be hard on your vehicle, but the chemicals that are used to fight the elements such as road salt and chemical compounds to melt ice are as well. Being prepared and knowing how to take care of your vehicle can help you avoid costly repairs and will extend the life of your vehicle. You never think about the condition of your windshield wipers until they don’t work properly in a rain or a heavy snow fall. 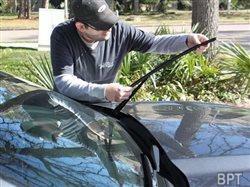 Rule of thumb is that you should change your wiper blades every six months. This will ensure you have the necessary vision on the road to drive safely even in less than ideal weather conditions. You may not think about what’s under the hood of your vehicle during the winter months, but protecting your engine and the components that make your vehicle run is important. Premium synthetic lubricant manufacturer Royal Purple recommends using Purple Ice, a year-round radiator conditioner that will provide corrosion protection and is fully compatible with antifreeze. A single bottle will treat a radiator for 30,000 miles when mixed with antifreeze to maintain maximum performance. Even if you take the best care of your vehicle, in some instances you cannot avoid a breakdown or incident when you’re on the road. Take the time to pack an emergency kit that you can keep stored in your truck. It could be a lifesaver if you have to put it in use. Include a: flashlight, batteries, blanket, snacks, water, gloves, boots, first aid kit, ice scraper/snow brush, jumper cables, road flares, white towel or window sign to indicate you need help. Before the colder weather sets in, getting your vehicle ready in advance will ensure you’re prepared for the winter driving months.